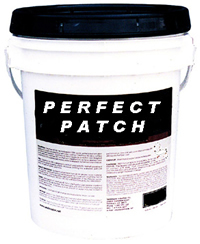 Perfect Patch, the most effective permanent 100% Epoxy concrete patching system. Extremely strong formulation makes Perfect Patch the ideal 100% epoxy patch that permanently repairs cracks, holes and pitted concrete surfaces. Resurfacing concrete is a breeze with Perfect Patch! Feather Edge down to a 1/16th of an inch! Three-part mixture includes epoxy, hardener, and silica filler. Apply with a trowel. With expansion and contraction of concrete due to the freeze-thaw cycles concrete slabs will eventually develop cracks. This can be augmented at the cold joints of 2 slabs poured at different times. 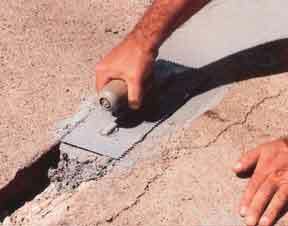 The primary objective of patching and sealing a crack in the patio, driveway or walkway is to stop water seepage from getting underneath the concrete where the ground becomes unstable holding the concrete slab. 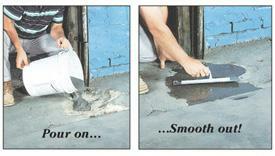 The best way to seal a crack in the concrete slab is by using a 100% epoxy to harden and waterproof the area. Using sealers or fillers from the local big box store like Home Depot will only be temporary. You must use a 100% epoxy! 1) Clean any loose debris out of the crack or pitted area on the concrete slab. Use a pick, screwdriver, or stiff broom. 2) Next Mix the Perfect Patch Epoxy parts (the resin and hardener) together in the included pail. 3) Fill the crack, hole or pitted area. Use a trowel and featheredge as thin as you can giving it a smooth surface. Again, all you do is mix the resin, the hardner, and the aggregate together which makes a 4.5 gallon pail of super strong mortar that when applied will provide you with a impervious diamond like finish drying to over 12,000 PSI. If you have any concrete surfaces that are worn out or have hairline cracks and crevices applying Perfect Patch will restore and in most cases exceed the strength of the original concrete. Once you put down Perfect Patch it's permanent and 10X stronger than the surrounding concrete. Perfect for High Traffic Areas and impervious to Corrosives, Rock Salt, and chemical spills. Use on walkways, stair cases, streets, walls, ramps, and any concrete surfaces indoors or outdoors. Perfect Patch can be used in federally-inspected food processing plants. Dries in 4-6 hours and is ready for light traffic in 12 hours. Three-part mixture includes epoxy, hardener, and Aggregate. Apply with a trowel, hand tamp or roller. The 50-lb. pail covers 100 square feet at an 1/8th inch thick. Pot life is 45-60 minutes. Color is concrete gray. Other colors available by calling 800-788-9195 - talk to a product specialist. Dries to a permanent 12,000 PSI! Resealable lid- only use what you need - long shelf life- store the rest for concrete repair needs as they arise. Used on cracks in sidewalk & in warehouse. Hard as a rock when it cures. Did a great job for us, we'll be buying a lot more.